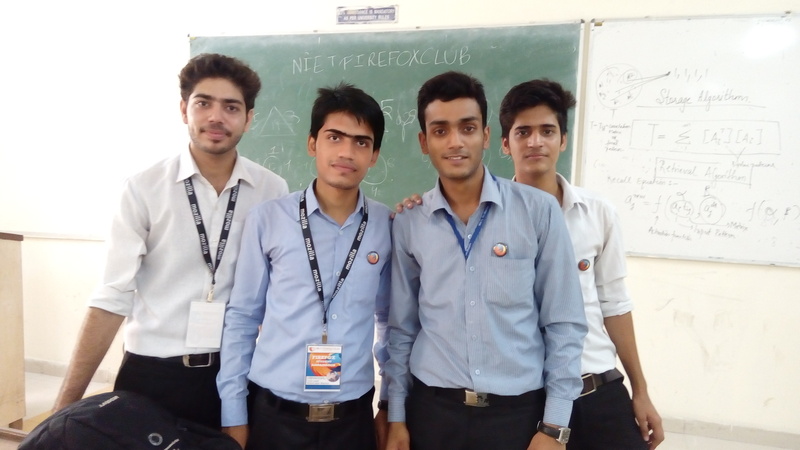 A mind boggling day rose, with many inquisitive minds battling for glory at the onset of the Enigma, a quiz competition on Firefox and its various tools was organized by the NIET Firefox Club on Saturday, August 22nd. For the promotion of this event, the team had left no stone unturned which could clearly be seen by a simple glance at the college premises. The banners of Enigma were all over the place: Notice boards, canteens, labs, auditoriums. As the audience gathered, they were not ready, nor had they anticipated this level of brain storming puzzles as they sat on their respective benches eager for the quiz to begin. 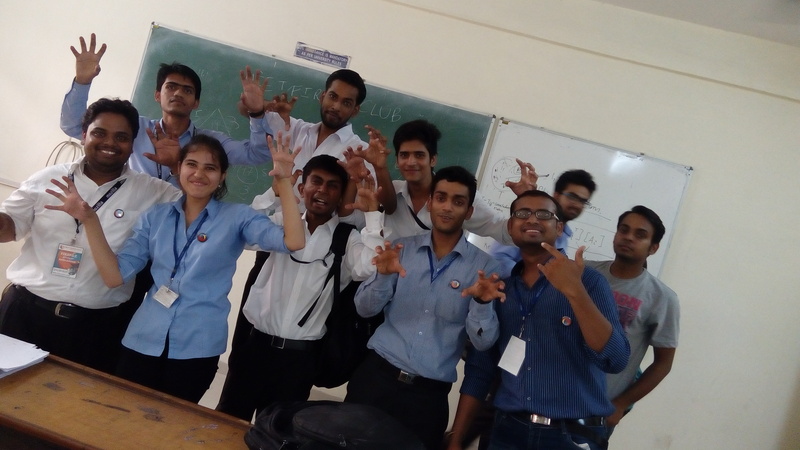 As the time came closer for the much awaited quiz to start , the nervousness levels of the students shot up, but so did their confidence and excitement levels. Their nervous faces had eyes that clearly showed their confidence to win and become the brain of the college. This excitement was not only limited to the students, but also to the event organizers who got butterflies in their stomachs on seeing the growing registration speeds. When the number of registered students crossed 300, they were thrilled as it was a lot more than expected. But this also came with a sense of responsibility of handling a big crowd, but the committee had sworn to make this event a successful one and so tasks were divided between the committee members and everyone tried their level best. And there it was, the most awaited time of the day, as soon as the clock sung 9:00, the papers were distributed and after seconds there was pin drop silence as all the participants struggled hard to solve the mind boggling questions. 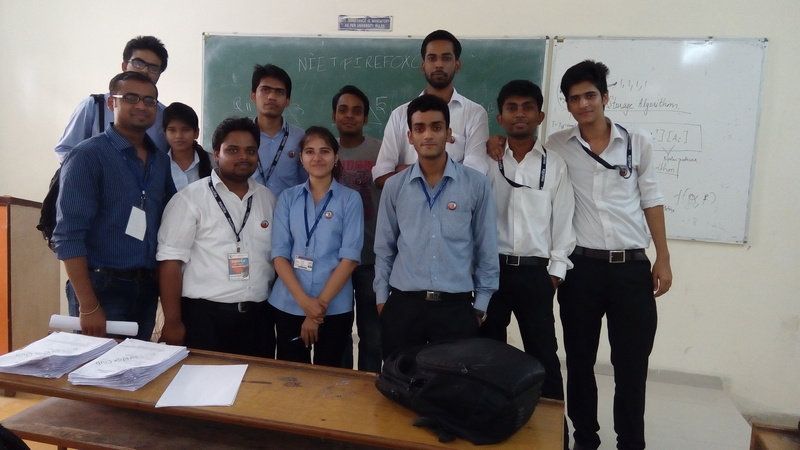 Rounds were taken by the faculty mentor Dr. Sandeep Gupta and the HOD Prof. C S Yadav to ensure the smooth running of the program, they were surprised to see the vast participation and interest shown by the students in Enigma. The quiz came to an end 45 minutes after the papers were distributed. The evaluation committee then sat down to check the answer sheets, meanwhile the students had an interactive session with the club leads as they made them aware about the Webmaker Tools and other tools of Mozilla Firefox. 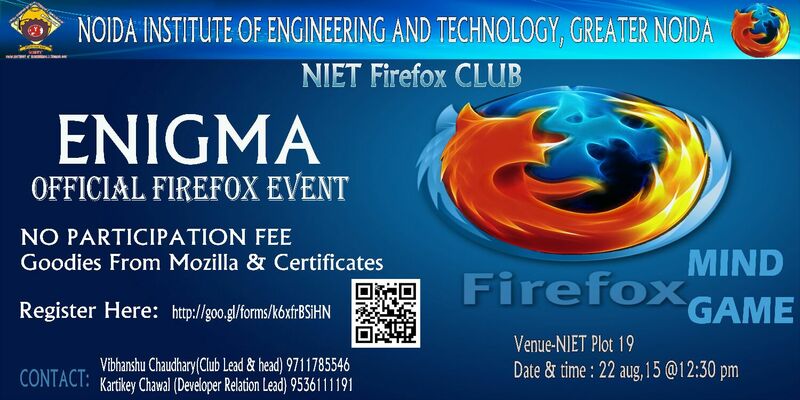 The event then proceeded to announce the winners who received goodies from Mozilla Firefox.